Eye-Fi is one company that we thought might not last the distance when they came up with the first wireless memory cards in the world, but it is nice to see them still hanging around, and doing pretty well in fact. Today, they have just announced a range of new wireless memory cards which will deliver the next generation Eye-Fi experience in the form of the the award-winning Eye-Fi Pro X2. What does the X2 family of Eye-Fi cards offer for the layperson? We are talking about faster-than-ever wireless photo and video uploads, improved performance, and virtually endless storage capacity with Endless Memory mode. Depending on your needs and capacity, these new wireless memory cards will retail from $49.99 upwards. Apart from new hardware, Eye-Fi has also increased its number of hotspot upload locations to over double of what it originally had. Now, users of the Hotspot Access feature will be able to upload photos and videos straight from their camera at more than 21,000 hotspots across the US, and these include 6,500 Starbucks coffeehouses, and Harborlink hotspots such as BP gas stations. Sounds like the perfect place to stop if you are embarking on a road trip, eh? The Eye-Fi Connect X2 and Explore X2 will join the Pro X2 as Eye-Fi’s new family of products, where each of them will boast Class 6 performance, an 802.11n radio which is much faster when it comes to uploading data as well as the vaunted Endless Memory mode. You ought to be able to pick up all these Eye-Fi Cards from retailers such as Best Buy, Office Depot, Amazon.com, Adorama, B&H and J&R. We’ll look at the various Eye-Fi cards in greater detail just below. 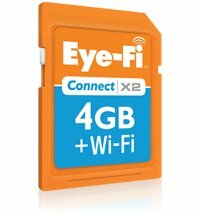 Eye-Fi Connect X2 – At 4GB capacity, the Eye-Fi Connect X2 will automatically upload JPEG photos and videos to the computer and one of more than 25 online sharing sites, such as Flickr, Facebook, YouTube or Picasa, through a Wi-Fi network. MSRP: $49.99. Eye-Fi Explore X2 – At 8GB of capacity, the Eye-Fi Explore X2 will automatically upload JPEG photos and videos to the computer and one of more than 25 online sharing sites. It offers lifetime automatic geotagging so photos and videos arrive at the user’s computer with location information already included to identify where the image was captured. Explore X2 also offers one year of hotspot access for uploading away from home at more 21,000 hotspot locations across the Unites States and through open hotspots. MSRP: $99.99. Eye-Fi Pro X2 – Unveiled at CES and winner of CNET’s “Best of CES” award, the 8GB Eye-Fi Pro X2 will automatically upload JPEG and RAW photos and videos to the home computer, and will send them to one of more than 25 online sharing sites. It also allows users to create an ad hoc connection directly to their computer to wirelessly upload photos and videos while away from a wireless router. Like Explore X2, Pro X2 offers lifetime geotagging and one-year of hotspot access to enable uploads away from home at more than 21,000 hotspots and open hotspots. MSRP: $149.99.